Telangana govt caps weight of school bags for students from primary to Class X: Schoolchildren in Telangana will no longer have to carry loads of textbooks and notebooks following a government order on Tuesday capping the weight of school bags for students from primary school to Class X. The order, which came into effect from Wednesday, made it mandatory for all the school managements to ensure that the students do not carry more than the prescribed weight of school bags. According to the order, the maximum weight of a school bag with textbooks and notebooks should not exceed 1.5 kg for Class 1 and II; 2-3 kg for Classes III to V; 4 kg for Classes VI and VII; 4.50 kg for Classes VIII and IX and 5 kg for Class X students. Until now, school children were carrying bags weighing from 6 kg to 12 kg at primary level and up to 17 kg at high school level, the government noted. “This has a severe, adverse physical effect on the growing children which can cause damage to their vertebral column, knees and can also causes anxiety disorders in students,” the order said. The order said the heavy load was caused by the fact that the children bring textbooks, guides, homework notebooks, rough work notebooks etc., to the classroom every day. Therefore, clear guidelines of what to bring to the schools is required, it said. The school managements should inform students well in advance about the textbooks and notebooks to be brought to the school on a particular day. The department asked the schools to sensitise parents and students about appropriate kind of school bags to be used. The order also said that there should be no homework for primary school students and all work pertaining to exercises given at the end of each unit or lesson in textbooks should be done during school hours under supervision of teachers. “The school should plan for homework to classes VI to X by allocating particular days for homework for specific subjects,” the order said. The order also asks schools to provide safe drinking water so as to avoid children getting water bottles from home, which add to their load. The Andhra Pradesh Child Rights Association has welcomed the move and said the government should ensure strict implementation of the order. “The officials should take action against the school managements which insist on workbooks and other material, thereby overloading the students,” association president P Achyuta Rao said. All the RJDSEs, District Educational Officers in the State are hereby informed that wide reference cited, the Government has issued orders on reducing· the load of School Bag in Primary, Upper and High Schools of all Managements under the Government, Local bodies, Aided and Un Aided Private schools in the State to implement the guidelines for classes I to X with effect from this academic year of 2016-17 onwards. Copy of the Government orders vide reference cited is enclosed. The DEOs are directed to communicate the Government Orders vide reference cited to all the HMs of all type of schools under Government Management and Private Managements. All the DEOs are directed to convene meeting with MEOs with respect to Primary School and HMs for High Schools to discuss the guidelines for implementation without fail. Further they are directed to conduct orientation to the Managements of Private Schools, parents and SMCs on the guidelines reducing the school bag load and its implications to school managements and parents. The School Management Committees shall observe this in the schools during their visits to schools and during School Management Committee meetings. The DEOs shall monitor the implementation of guidelines in all types of schools and see that the School Bags are within the Weight norms as per Government Orders. All the DE Os are informed that the 1st Week of August 2017 shall be observed as School Bag awareness week where District Level Teams may be sent to the schools for observations. The State Level Teams will be deployed to observe the implementation of guidelines on reducing the School Bag Load in all schools. 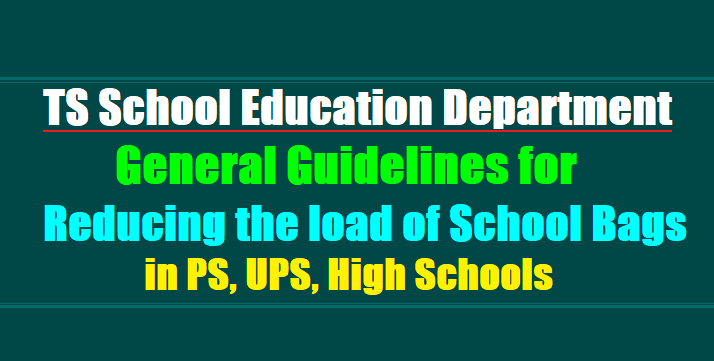 · All the RJDs and DEOs are directed to take immediate necessary action and implemented the guidelines on reducing the School Bag Load vide reference cited. SCHOOL EDUCATION DEPARTMENT - Reducing the load of School Bags in Primary, Upper Primary and High Schools - Certain Guidelines - Issued. Read: From the Commissioner & Director of School Education, Telangana, Hyderabad, Lr. Rc.No. 843/DSE/Planning-I/2017, Dated 28.06.2017. ORDER: The Commissioner & Director of School Education, Telangana, vide reference read above has submitted proposals for the issue of Guidelines for reducing the load of School Bags in Primary, Upper Primary and High Schools because heavy School Bags are a serious threat to the health and wellbeing of the students. The load of a School Bag, as estimated in some of the districts, weighs about 6 to 12 Kgs at Primary level and 12 to 17 Kgs at High School level. This has a severe, adverse physical effect on the growing children which can cause damage to their vertebral column and knees it also causes anxiety in them. Moreover, in the schools which are functioning in multistoried buildings, the children have to climb the steps with heavy School Bags, which further aggravates the problem and health consequences. 2. This heavy load is caused by the fact that the children bring textbooks, guides, homework notebooks, rough work notebooks etc., to the classroom every day. Therefore, clear Guidelines of what to bring to the schools is required. A Survey on the School Bag load was taken up in some of the districts and based on the Survey, an exercise has been taken up to arrive at the proper load of the School Bags and a Policy on homework and assignments. • All the schools following the State Curriculum have to follow the textbooks prescribed by the State Academic Authority i.e., SCERT, Government of Telangana. The number of textbooks in different classes should not exceed the number prescribed by the SCERT for the corresponding class. • Schools should focus on making the children understand concepts rather than just memorising the concepts. Freedom should be given to the children to read, comprehend and express for themselves. • Schools should avoid repeated copying from the text books / guide books during and after the school hours. • Reading library books and participation in Games, Sports, Art & Culture and other creative, co-curricular activities for holistic development of the children must be encouraged. • Feedback on the assessment and the performance of the children is a must to improve the performance of the students and also the teachers. The use of Guides and Guide type study material should be avoided and children should be made to think, imagine and construct their own answers. • The subject-wise Guides or Guide type study material/workbooks are not to be used as stipulated vide G.O.Ms.No.17, School Education (PE-Prog.II) Department, dated.14.05.2014. Children are expected to write answers to the questions and other tasks given in the text books on their own to be corrected by the teachers. • Strict adherence of the Academic Calendar in terms of the school timings, examination schedule, nature of assessments, CCE etc. is required. • Games and Sports in the evenings must be encouraged rather than engaging the children again in tuitions and homework only. Recreation and physical activity is a must for a growing child and it is the right of the children. • Focus on the foundational skills(3Rs) of the students i.e., basic competencies of reading, writing and arithmetic should be emphasised which prepares children for self learning. Every school must ensure these foundational skills among the children before starting the regular class syllabus. • Class-Interaction must be encouraged rather than mere presentation of information in the name of syllabus coverage. There should be dialogue and discussion and the children engaged with challenging learning tasks such as projects, experiments, field visits, book reviews, discussion on social and contemporary issues etc. II. A.Guidelines for Primary Schools. • Three textbooks have been prescribed for Classes I & II i.e., Mother Tongue, English, Mathematics and four textbooks have been prescribed for Classes III to V i.e., Mother Tongue, English, Mathematics and Environmental Studies by the State Academic Authority i.e., SCERT, which should be followed. • There should be one note book of 100 pages for each subject for under- taking Formative Assessment items such as textbook exercises, projects, slip tests etc. This too the children need not bring everyday to the school. Two subjects per week i.e., @ 3 days per subject shall be prescribed along with two 100 pages double ruled note books for improving the handwriting. • The schools should provide safe drinking water to avoid children getting drinking water bottles from their houses. • There shall not be any homework for primary grade children i.e., from Classes I to V. All the work pertaining to exercises given at the end of each unit/lesson in the text books, should be done during the school hours under the supervision of the teachers. Separate periods should be allocated for undertaking exercise part in the class itself after completion of the teaching of the particular unit/lesson. Enough time for this practice should be made available in the school time table itself. • The weight of the School Bag has been calculated as per the above Guidelines and found that by including the textbooks and notebooks and the weight of the empty School Bag for Classes I & II, is should not exceed 1.5 Kg and with regard to Classes III to V it should be about 2 to 3 Kg. • As per the State curriculum, six Textbooks have been prescribed for Classes VI & VII i.e., 3 language Textbooks and one Textbook each for Maths, Science and Social Studies. For Classes VIII to X, there are seven Text books prescribed i.e., 3 language Textbooks and one textbook each for Maths, Physical Science, Biological Science and Social Studies. • There shall be one note book of 200 pages for each subject for under taking Formative Assessment items such as textbook exercises, projects, slip tests, experiments etc. This too the children need not bring everyday to the school. There shall be one note book as rough note book for all the subjects to be brought everyday to the school and used for class work. • All the work pertaining to exercises given at the end of the each unit/lesson in the text books should be performed during the school hours under the supervision of the teachers. Separate periods should be allocated for undertaking exercise part in the class itself after completion of the teaching of the particular unit/lesson. Enough time for this practice should be made available in the school time table itself. Children should be encouraged to think and try performing these exercises and tasks on their own, with the assistance of the teachers, wherever necessary. may be discussed and finalized by discussing in the Staff Meetings by the Head Master/Head Mistress concerned. For instance for Classes VI to VIII, language subjects can be for the first three days of the week i.e., from Monday to Wednesday and non language subjects from Thursday to Saturday. Similarly, for the Classes IX and X, the non language subjects can be from Monday to Wednesday and language subjects can be from Thursday to Saturday. • The weight of the School Bag has been calculated as per the above Guidelines and found that by including the textbooks and notebooks and the weight of the empty School Bag, for Classes VI & VII it should not exceed 4 Kg and with regard to Classes VIII & IX, it should not be more than 4.50 Kg and in the case of Class X, it should not be more than 5 Kg. • Inform the students in advance about the books and notebooks to be brought to the school on a particular day. • Inform the students and parents regarding appropriate kind of School Bags i.e. which have broad padded straps for symmetrical distribution of weight. Bag and should not sling the Bag over one shoulder. • The students should keep the Bag down while waiting for the school conveyance or in the school Assembly. • The schools must ensure that students carry books only according to the timetable. • School Heads should counsel the parents and teachers about the health issues arising out of the children carrying heavy School Bags to school. • Schools should not prescribe additional and supplementary textbooks that are voluminous, costly and designed in a pedagogically unsound manner other than by SCERT. • Students should be encouraged to repack their bags on daily basis and avoid carrying unnecessary articles, textbooks and workbooks that are not needed. • The schools must frequently check the School Bags to ensure that the students are not carrying heavy Bags with unnecessary material. 3. After careful examination of the matter, Government hereby accept the proposals of the Commissioner & Director of School Education, Telangana, Hyderabad, as read above and direct the Managements under the Government, Local Bodies, Aided and Un-Aided Private Schools in the State to implement these Guidelines to reduce the load of the School Bags for Classes I to X, with effect from this Academic Year, 2017-18, onwards. 4. The Commissioner & Director of School Education, Telangana, Hyderabad, shall take further necessary action accordingly.